With all these talks and raves about the new hype in town (read: salted egg lava something), we’ve decided to steer away from the crowd a bit and zeroed in on Singapore’s favourite cuisine – Cantonese. 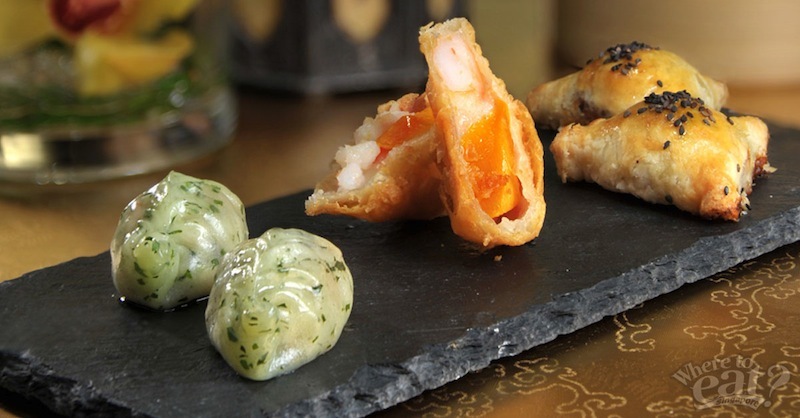 The Cantonese veteran restaurant worked their magic in adding a new array of scrumptious dishes to the menu. Taking into consideration guest’ increasing preference for dishes with less sugar, oil, salt and seasonings, chef Brian continuously explores ways to bring out the natural flavours of each ingredients while reducing the amount of sugar, oil and salt added – this is without compromising with the interplay of taste, textures and nutritional benefits. We’ll pave the way and set the ball rolling with a few dim sums. With absolutely no colourings or additives, sprinkles of vegetables are incorporated into the delicate skin that would require a saucy boost, which the fillings achieved, to flesh out the overall flavours. 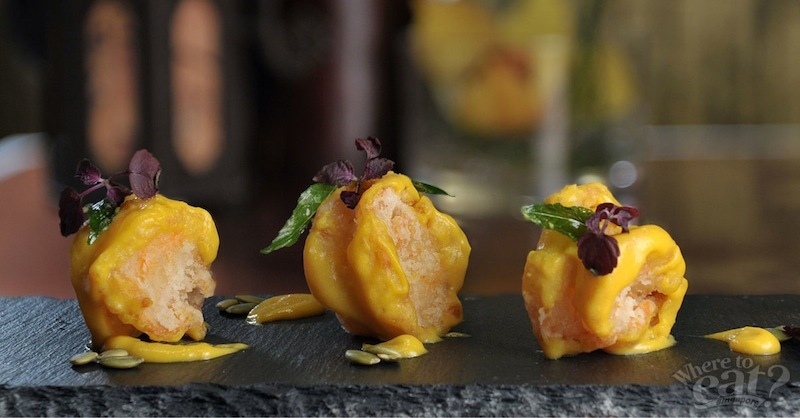 This dish of battered prawn and mango is a little less complex but no less fantastic. First you’d feel a light crunch from the deep-fried outer layer before it navigates you into an unbeatable texture and taste of firm prawns and mushy mango. The restaurant’s list of dim sum always looked tastefully divine, but adding this flaky puff made sparkles it even more. The sweetness and heat of black pepper struck a perfect balance, while the crust of the puff is barely incidental. The flaky puff, with a subtle fragrance of butter, serves as a wonderful pillow to soak up the juicy sauce. We figure it’s not hard to have 5 at one go. 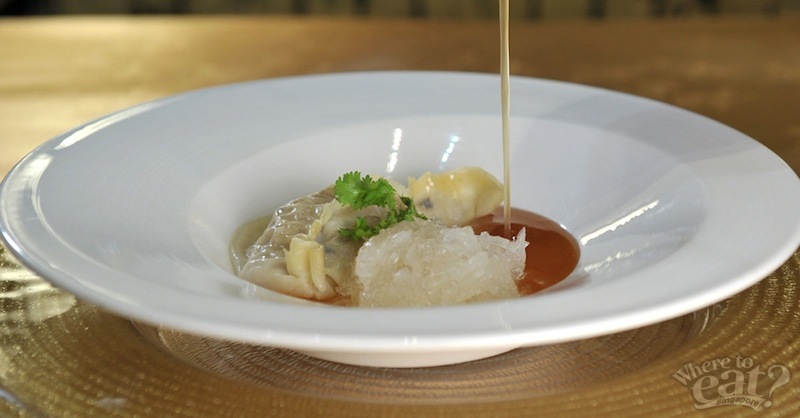 Resting elegantly beside a small heap of Bird’s Nest on a bed of champagne-coloured broth, the handmade dumpling is packed with scallop, prawn and conpoy opulence. The thick creamy broth, which is brewed for 4 hours, lurks the hard work of the chef and the nutritional goodness of its ingredients. Moving onto the mains, the colourful, generous flavours of this dish would strike a chord with its taster. The chef’s trick for getting the most out of the sweetness in this dish is steaming the pumpkin before frying it with chilli and curry leaves and letting it reduce into a thick puree. 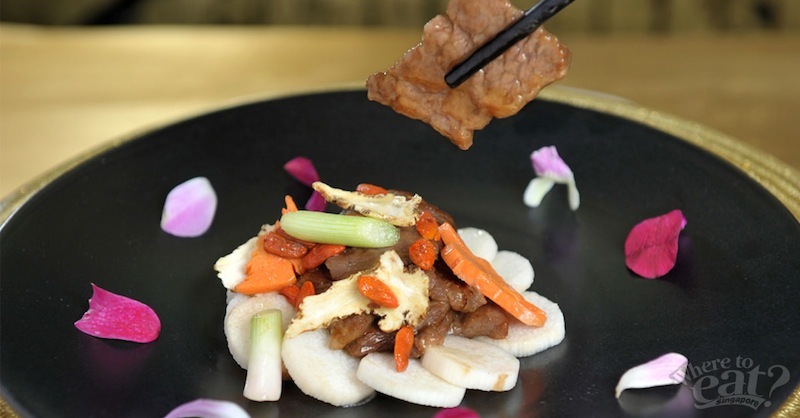 Not to be missed is the juicy, tender and nutritional powerhouse Wok-fried Beef Fillet with Angelica and Chinese Yam. 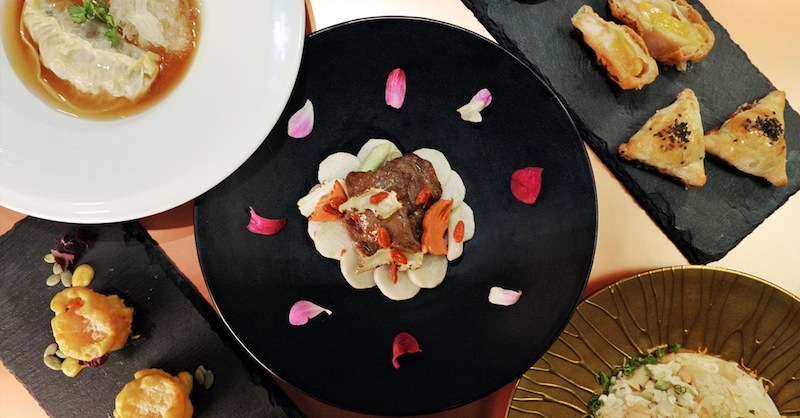 Tender marinated beer, fresh chinese yam and wolfberries are sauteed in the potent flavour of 2-weeks old Hua Diao wine infused with angelica sinensis. 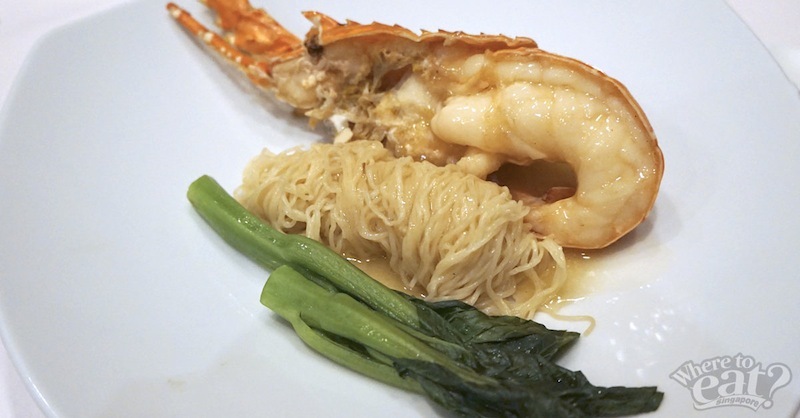 This dish is plated up beautifully – thin, mucilaginous noodles swimming in a sea of superior stock, decorated with a vibrant poached lobster by the side. With absolutely no salt used, the overall quieter flavour is in good proportion with the fresh crunchiness of the lobster. Don’t end this meal without giving this quaint and beautifully simple dessert a shot. 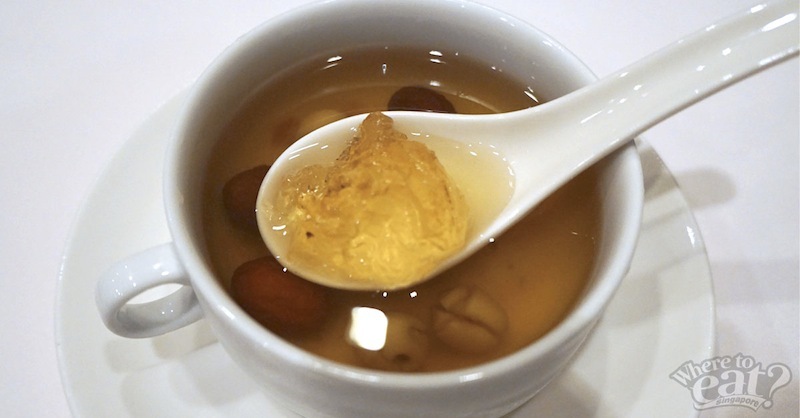 Adorned with plump red dates, bittersweet lotus seeds and almost translucent peach resin, this would be a sure crowd-pleaser to the end of a meal, especially for the ladies since it is believed to be filled with collagen. The new ala carte menu will be available at Wan Hao Chinese Restaurant from 9th May onwards.